54 per case, 3.4 oz. 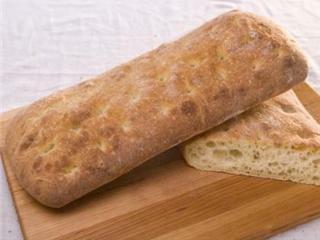 Ciabatta is a light and delicate flatbread loaf with a hint of sweetness. Its a beautiful table bread and complements cheeses, salami and sausages. With its crisp crust and soft, porous texture it proves to be an Italian classic. 14 per case - 17.4 oz. 12 per case - 17.4 oz. A unique extruded crisp bread made from the finest all natural ingredients, quality seasonings and toppings. Everything includes: sesame seeds, poppy seeds, and minced onions. 280 per case - 5 lb. A crisp golden crust surrounds moist, creamy dough. Perfect for dipping in olive oil and balsamic vinegars. 14 per case - 20 oz. Focaccia crust is a flatbread made with unbleached flour, imported extra virgin olive oil, garlic and other fine ingredients. All natural - no preservatives and non-dairy. A marriage of thyme, marjoram and sage creates a delicate and subtle flavor. 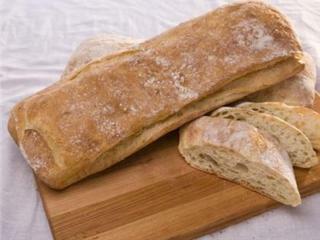 This soft and moist artisan bread is sheltered beneath a crisp amber crust and is perfect for dipping in olive oil. Made with "00" flour from Italy for the finest taste.